Just in case the stench of a federal fraud scandal that has plagued college basketball for nearly two seasons, caused one Sweet 16 coach to be suspended and hangs like a cloud over at least a dozen other programs was beginning to fade … well, along came Monday. Nothing like having Michael Avenatti enter your world. 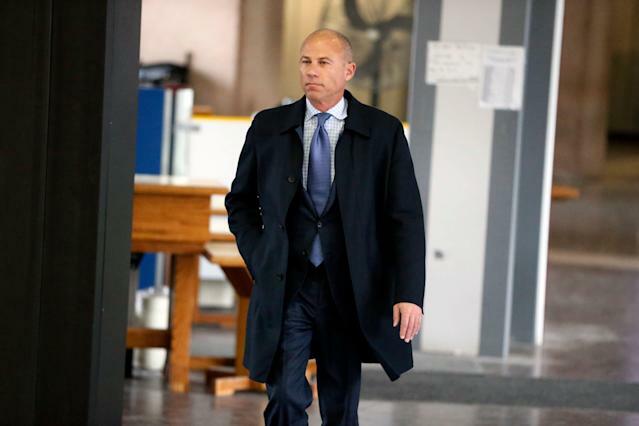 Avenatti sprung to cable news fame by representing an adult film star who allegedly was paid off by President Donald Trump. He even hinted at running for the White House himself while engaging in endless dramas and soap opera scapes with any and all comers. Monday he was indicted for allegedly trying to extort Nike to the tune of nearly $25 million after threatening to reveal the shoe company was paying off high school basketball recruits the way Adidas employees did, which caused half this mess in the first place. Oh, and Avenatti’s unindicted co-conspirator, per the Wall Street Journal, is Mark Geragos, another cable-television lawyer who recently represented Colin Kaepernick in his legal fight against the NFL. Nike, of course, proudly sponsors Kaepernick (ah, loyalty). The circle of sleaze here is dense, but that’s the world college basketball has created for itself. The NCAA tournament is supposed-to-be this purified bit of Americana, but the underbelly is far too robust due to amateurism rules that create a black market for people to exploit and then allegedly others to exploit by blackmailing the initial exploiters. “A suit and tie doesn’t mask the fact that at its core this was an old-fashioned shake down,” U.S. Attorney Geoffrey Berman said Monday. He was speaking about Avenatti. He could have been speaking about a lot of well-dressed college administrators and basketball coaches, as well. This is just the latest bomb to those in college athletics that has people caring less about busted brackets and more about just getting busted. Once the Southern District was able to essentially codify the NCAA rulebook last October, at least half the sport became a potential criminal. Avenatti is facing serious consequences — four counts of extortion out of the Southern District of New York and separate counts of wire and bank fraud from federal prosecutors in Los Angeles. The lawyer was trying to blackmail Nike to keep what Avenatti says is “evidence” from an AAU coach “that one or more Nike employees had authorized and funded payments to the families of top high school players.” Making such info public, Avenatti allegedly threatened, would not just put Nike employees at legal risk but cause the company stock top plunge, perhaps by billions. In terms of college athletics, the issue isn't just that such blackmail is possible, but that it doesn’t even surprise anyone. Of course this happened. Of course. The first fraud scandal has featured a slew of plea deals from college assistant coaches as well as an October 2018 trial that ended with three convictions. It was almost exclusively centered on the dealings of Adidas and Adidas-sponsored schools — notably Louisville, Kansas and North Carolina State. Yet Nike is the industry leader — the best players, the best teams, the biggest name coaches. And yes, that includes Duke, North Carolina, Kentucky and other perennial national title contenders. On wiretaps and intercepted text messages, Adidas executives and coaches openly talk about how they are just trying to keep up with the swoosh. Well, here comes Nike. Perhaps. While no specific names or colleges were mentioned in the indictment, the Cal Supreme website lists a number of prominent former and current college players, including current NBA rookie Deandre Ayton (Arizona) and likely lottery pick Bol Bol (Oregon), who is injured. Just about every Pac-12 team, let alone nationally, recruited Cal Supreme and there is no telling what “payments to others as well” might mean or include. Just before being arrested Avenatti scheduled a news conference for Tuesday at 11 a.m. ET to tell all. Perhaps that is not going to happen as planned, but because someone is arrested for extortion doesn’t mean the information they were allegedly going to use to extort just goes away. In this case it’s back to college basketball playing its most popular game — wondering what Avenatti might reveal, when he might reveal it and who is going to get busted by the NCAA, if not the feds, when he does? Avenatti was charged by the SDNY, the same office running the fraud cases. The lead prosecutor, Ted Diskant, was at Monday’s news conference to announce Avenatti’s arrest. That original case includes a scheduled late-April second trial where defense attorneys have said they will subpoena prominent college coaches such as Sean Miller (Arizona) and Will Wade (LSU) to testify about what they said on FBI wiretaps. It’s partially why Wade isn’t coaching LSU during their current NCAA tournament run. LSU is but one public relations problem for this sport. During the October trial it was revealed that Kansas believed they needed to find a job and a house (as well as pay) for the “father” of Zion Williamson to get him to play for them. Zion, of course, went to Duke instead. Oregon was said to have made an “astronomical offer” to another recruit they didn’t land. Auburn has had two assistants caught in the middle of two different federal fraud cases. There’s more, of course, because there is always more. And now there is Michael Avenatti out there, a man long willing to say anything and now allegedly do anything to help himself. Why would he stop now? He's a man who loves bathing in the muck. No wonder he somehow got himself involved in college basketball.